I have enjoyed earning a FREE cruise the last two years with my healthy chocolate business. I am thankful to be involved in a home based business that allows me the opportunity to earn great trips, cars, money and so much more. FREE CRUISE! REALLY! YOU CAN DO THIS! This opportunity literally fell into my lap. I was not looking for a business, I was actually looking for a way to improve my health and the health of my family. My family, like many families had been dealing with many chronic health issues. My husband had been injured in a work related accident and after many back surgeries was left in constant pain and with nerve damage. I have an adult autistic son who was struggling with severe mood swings and I was dealing with fibromyalgia and chronic fatigue. We were in healthcare crisis mode. I decided no more processed foods and we need to get back to the natural healthy foods like grandma used to make. I went to a local health food store in Southwest Florida, Near North Port and the rest is history. Basically the lady in the store told me I could lose weight eating chocolate. I had figured losing weight could help with my fibromyalgia symptoms so I was on board. What I did not realize at the time was that this chocolate was as close to raw as you can get. The difference between this chocolate and store bought candy is significant. Beyond healthy chocolates are cold pressed. important because cold pressing keeps in the antioxidants from the raw cacao. The antioxidant values are listed on every Beyond product and they are off the charts. 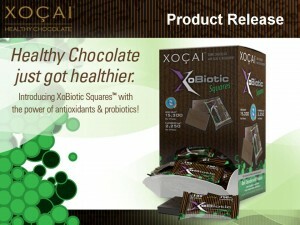 All the Beyond healthy chocolate Company products are high antioxidant superfoods. When I started eating the chocolate, I had more energy and started sleeping better. I really was not sure why. I later found out that antioxidants reduce inflammation. Inflammation is responsible for over 200 diseases including heart disease and cancer. I was shocked that I did not know about this amazing healthy chocolate that could help me lose weight, tastes great and is good for my health. It has been a great business for me. Not only have I earned free cruises and get to hobnob with the multi-million dollar earners with Beyond, I also was able to meet and talk with the founders Jeanette Brooks and Andrew Brooks. It is a honor to work with people with such integrity and who actually care about their promoters. Getting Started Could Not Be Easier! Getting in to this home based business could not be any easier. 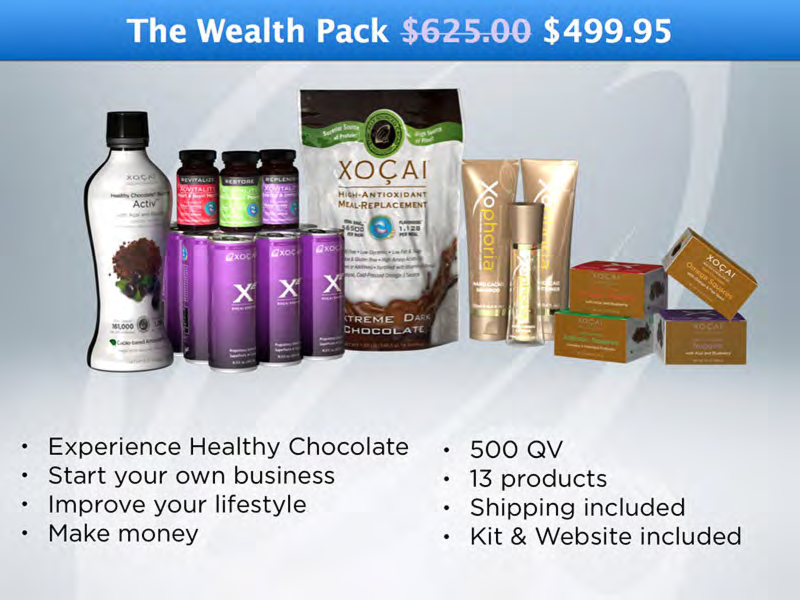 Most people get started with the VIP Wealth pack for $499.95 This gets you products in our entire line including the Beyond Beauty Cream anti-aging skin care cream for men and women, the Xe healthy energy drinks that Bill O’Reilly raved about on his Factor Tip Of The Day, The Beyond meal replacement shake which was featured on the cover of the Bariatrician, The American Journal Of Bariatric Medicine along with the study confirming the average weight loss of 31 pounds in just 12 weeks and over 5 inches around the waist. It also includes a month supply of the Xovitality chocolate pills good for heart and brain, antioxidant power and energy and immunity, the Activ drink which is similar to the drink that Harvard University studied when the Mayans were not getting sick like we do here in the United States. You even get the Beyond Beauty Cream shampoo and conditioner which are amazing for thin and fine hair and the sample box of Beyond chocolates including nuggets, power squares, omega squares and Xobiotics. Another way to get in the business is to get started as a business builder. This gives you the opportunity to pick six monthly products of your choice and get three free. All of these offer a great incentive. Use automatic monthly order, also known as subscription and receive a free product of your choice every third month for the first year! Now that is huge. My customers and team members love free products. If you want to work from home, or start a home based business that will ultimately let you retire or work from home, this is your opportunity. Beyond chocolates use a patented process. There is not a company out there that can claim the antioxidant values of our healthy dark chocolates. We even own the right to the words “Healthy Chocolate”. We need to talk. Contact us today to Change Your Chocolate and change your life. I can be reached at 941-216-5727, you can email us directly at [email protected] or visit our site at HealthyChocolate.Website . PreviousWhere Is The Best Place For Your Teenager To Buy Their First Car; Ebay, Craigslist or the local newspaper? NextCan Dark Chocolate Reduce The Risk Of Death From Heart Attack?